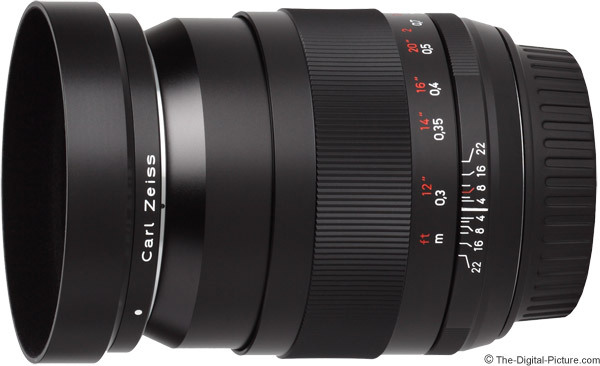 Note: The Zeiss 35mm f/2 Classic Lens has been replaced by the Zeiss 35mm f/2 Milvus Lens. The manual-focus-only Zeiss 35mm f/2.0 Distagon T* ZE Lens is a remarkably well-built lens that delivers very good image quality at a reasonable, moderate price. The Zeiss 35mm f/2.0 Lens review was created in conjunction with its wider-aperture sibling lens review - the Zeiss 35mm f/1.4 Distagon T* ZE Lens Review. As these lenses share some similar attributes - especially their focal length, I will be borrowing some of the same comparisons and other material from that review. 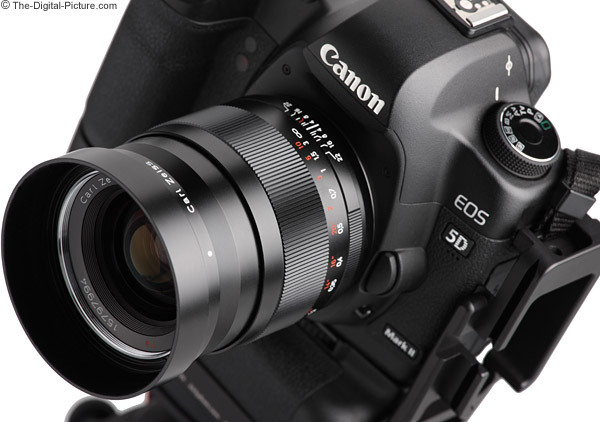 Sharing the same modestly-wide focal length, the two ZE 35s will get used for many of the same large list of purposes. These include photojournalism, weddings, portraits (mid-body to full body and groups), landscapes, architecture, videography, capturing family life ... and much more. On an APS-C sensor format body, the Zeiss ZE 35 f/2 provides an angle of view similar to a 56mm lens on a full frame sensor format body. 56mm is close enough to 50mm to be used for all applications this extraordinarily popular "normal" focal length is used for - which includes many of the same uses as 35mm. One significant difference between the ZE 35 f/2 and the ZE 35 f/1.4 is the max aperture. The f/1.4 lens will allow twice as much light onto the sensor and will create a shallower DOF that results in a stronger background blur. Following is a comparison I created for the 35 f/1.4 review, showing the background blur changing through the aperture range. The f/1.4 image provides an example of what you are missing if you select an f/2 max aperture lens. Note that the ZE 35 f/2 will show a similar amount of vignetting at f/2 as the ZE 35 f/1.4 shows at f/1.4. It is not f/1.4, but an f/2 aperture is still relatively wide (or "fast"), will create a nice background blur if the subject is close and will work well in low light scenarios. Here is a Zeiss 35mm f/2.0 Distagon T* ZE Lens studio portrait sample picture. The Zeiss ZE 35 f/2 performs quite well in the image quality department. At f/2, ZE 35 f/2 delivers a very usable image. The center is reasonably sharp with sharpness degrading slowly to the outer edge of the full frame image circle where modest softness can be seen. At f/2.8, the center of the frame is nicely sharp, but it becomes slightly sharper as the aperture is stopped down even farther. Centers are razor sharp at f/5.6. Corner image sharpness makes a nice gain at f/4 and continues to show improvement through f/8. Landscape photographers will be quite pleased with their narrow aperture full frame images. 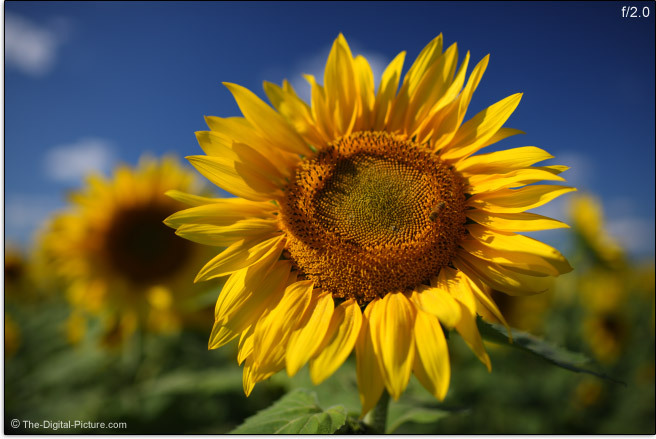 Noticeable vignetting is a normal attribute of wide aperture wide angle primes. The Zeiss ZE 35 f/2 is not an exception in this regard. At f/2.0, full frame body users can expect over 3 stops of shading in the corners with an evenly decreasing amount of shading into the center of the frame. As usual, stopping down the aperture (using a narrower aperture) noticeably reduces vignetting, but a just-barely-perceptible .6 stops is still visible at f/11.0. 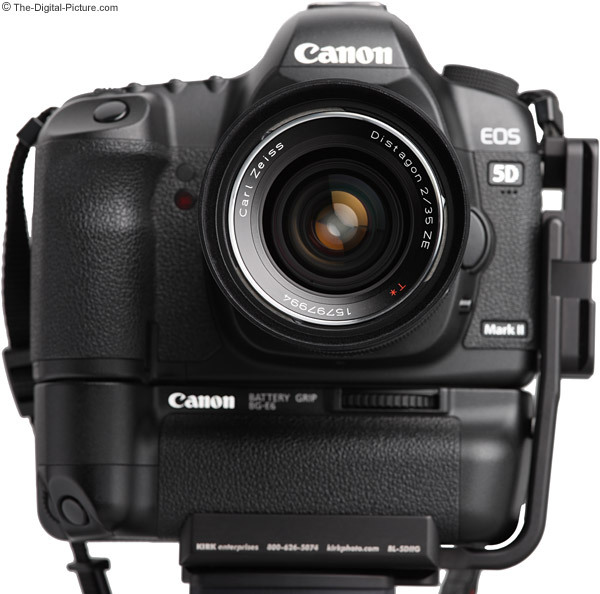 APS-C format sensor users will see a just-noticeable 1 stop of shading in the corners at f/2.0. The Zeiss ZE 35 f/2 produces small amount of CA (Chromatic Aberration) that is visible in mid through outer areas of the image circle. Full frame users will see some barrel distortion near the periphery of the frame if straight lines are present in that location. The ZE 35mm f/2 resists flare quite well, but like most lenses, is not completely flare free. The Zeiss 35mm f/2.0 Distagon T* ZE Lens has very nice bokeh (background blur quality) and, can create a nice background blur when the subject is moderately close. At review time, all Zeiss ZE Lenses are manual focus only. And all Zeiss ZE lenses have best-in-class manual focus mechanisms. The ZE 35 f/2's focus ring is nicely sized, is incredibly smooth, has the perfect amount of resistance and has a nice 112° rotation. The ZE 35 f/2 extends slightly (up to .2" / 5mm) during focusing. 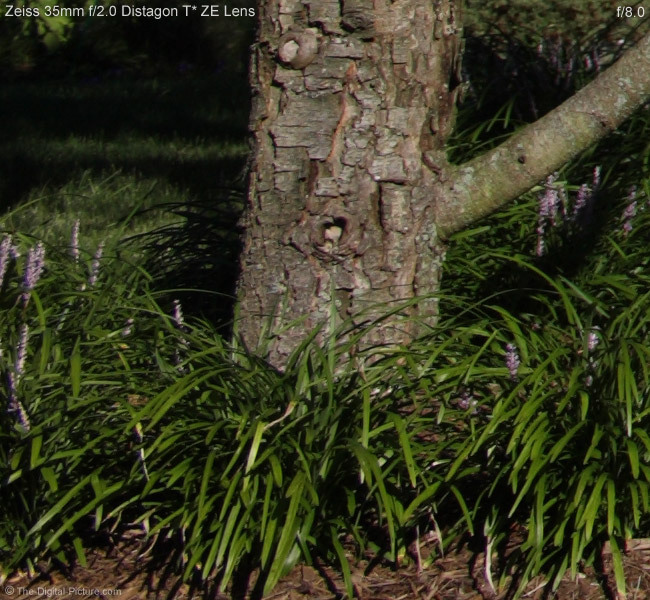 As strongly desired by circular polarizer filter users, the ZE 35 f/2's threads do not rotate during focusing. Focus distances in both ft and m are precisely engraved into the focus ring. The generous focus ring rotation allows more detailed distance markings to be provided on the lens. Detailed DOF (Depth of Field) markings, not commonly seen on autofocus lenses, are engraved into the lens barrel. The Zeiss ZE 35 f/2 does not exhibit focus breathing - subjects in the frame do not change size as the focus distance is changed. This attribute is especially important to videographers. The Zeiss ZE 35 f/2 will light up the focus confirmation light in Canon EOS DSLRs, but I don't find this light to be accurate enough to be relied on with the shallow DOF delivered at f/2. A specialized focus screen (a split prism) will make accurate manual focusing of this lens via the viewfinder a much easier task. Live View at 10x is my preferred ZE lens focusing method. The Zeiss 35mm f/2.0 Distagon T* ZE Lens' minimum focusing distance and resulting maximum magnification is near worst in class for similar lens, but most of these lenses are not amazing in this regard. The Zeiss ZE 35 f/2 is not compatible with extenders, but extension tubes will allow a significant increase in maximum magnification. Like all of the rest of the Zeiss ZE Lenses, the Zeiss 35mm f/2.0 Distagon T* ZE Lens is rock solid with an extremely smooth focusing ring. All current Zeiss ZE lenses feature all metal construction (including the focus ring grip) that provides a cold, hard, rock solid, precision feel that few other non-Zeiss lenses provide. These lenses feel like they would last forever. The Zeiss 35mm f/2.0 Distagon T* ZE Lens has no buttons, switches or any other moving exterior parts aside from the focus ring and the slightly-extending lens barrel. The extending portion of the lens is very solid - there is no play in this part. The Zeiss ZE 35 f/2 (and all of the other review-time-current Zeiss ZE lenses) is not weather sealed. 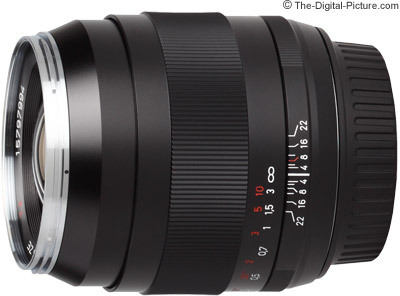 The Zeiss 35mm f/2.0 Distagon T* ZE Lens comes with a very nice, tiny metal lens hood. Petaled hoods look awesome, but round hoods (if they are sufficiently strong) allow a lens to easily sit mount-up with the hood installed. The ZE 35 f/2's installed hood takes up such a small amount of additional space that you may just leave it installed in ready-to-use position. Reversed, the hood fits very compactly on the lens body. The inside of the hood is flocked for complete reflection avoidance. The standard center-and-side-pinch Zeiss lens cap is easy to install/remove while the lens hood is mounted. No lens case is provided with the Zeiss ZE 35 f/2. Another Zeiss ZE lens common feature is that the lens mount alignment mark is not visible with lens mount cap in place. The Zeiss ZE 35 f/2 has small 58mm filter threads. This is a size shared by a modest number of other lenses, making filter sharing a possibility. Small filters cost less, take up less space and - weigh less. And having lighter accessories is especially helpful when Zeiss ZE lenses are in your kit. The Zeiss ZE 35 f/2 is not a heavy lens, but it is more than twice the weight of the Canon EF 35mm f/2.0 Lens. For many more comparisons, review the complete Zeiss 35mm f/2.0 Distagon T* ZE Lens Specifications using the site's Lens Spec tool. The Zeiss 35mm f/2.0 Distagon T* ZE Lens is a pleasure to shoot with. It is not big or heavy, but definitely has a solid feel. If you are carrying a pack full of Zeiss ZE lenses, you are going to feel the impact of their above-average weights. The Zeiss ZE 35 f/2 is modestly smaller than the Zeiss and Canon 35mm f/1.4 lenses. The same lenses are shown below in their fully extended states with their lens hoods in place. 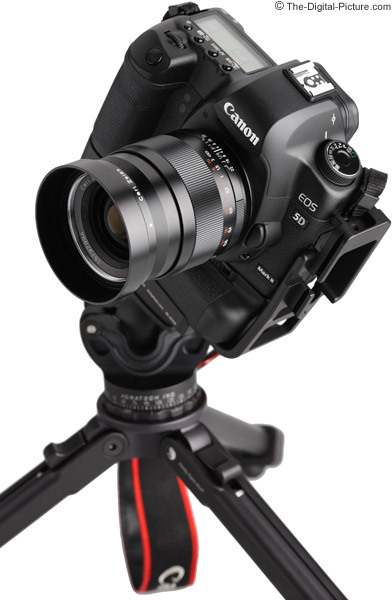 The ZE 35 f/2's tiny hood size gives it a noticeable ready-to-use size advantage, though the tiny hood does not provide as much protection for the lens. Click on the image below to see an image quality comparison between the Zeiss 35 f/2 and 3 other 35mm lenses. 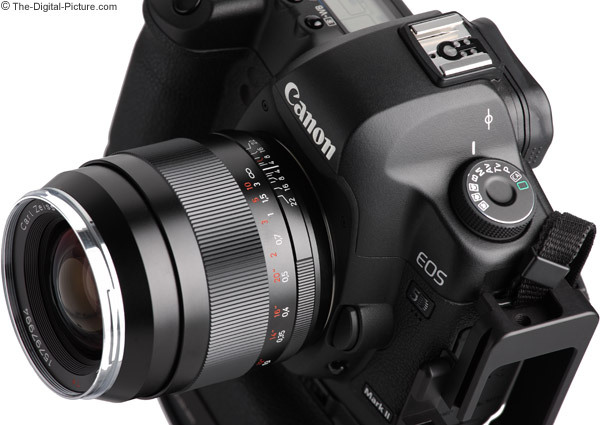 At f/1.4, Only the Zeiss 35 f/1.4 and Canon 35 f/1.4 participate in this comparison. The Zeiss 35 f/2 and the Canon EF f/2 join the challenge at f/2. At f/2, the Zeiss 35 f/2 and Canon 35 f/2 both show their wide open aperture vignetting. The Zeiss 35 f/1.4 is the clear winner at this aperture - across the entire frame. The inexpensive Canon 35 f/2 is, as to be expected, the clear loser. I give the Canon 35 f/1.4 the edge over the Zeiss 35 f/2 at f/2 - and the Canon is the clear winner in the center of the frame comparison between these two lenses at f/2. At f/2.8, the Zeiss 35 f/1.4 retains the advantage in the corners, but the Canon 35 f/1.4 eliminates most of the gap across the frame - and gains more of an advantage over the Zeiss 35 f/2 in the corners. The Zeiss 35 f/2 performs similar to the Canon 35 f/1.4 in the center of the frame. At f/4 and narrower apertures, the Zeiss 35 f/1.4 continues to retain the advantage in the corners, but the overall advantage over the Canon 35 f/1.4 is minimal. The Zeiss 35mm f/2 continues to trail the Canon 35 f/1.4 in the corners out to f/8 or so, when the two are both impressive. The Zeiss 35 f/2 continues to perform similar to the Canon 35 f/1.4 in the center of the frame where both are very sharp. The big advantage the Canon lenses have over the Zeiss lenses is autofocus. If you need the best autofocus 35mm lens with an aperture wider than f/2.8, the decision at this time is easy - get the Canon EF 35mm f/1.4 L USM Lens. The Zeiss 35mm f/2.0 Distagon T* ZE Lens is available in Canon (reviewed), Nikon (ZF.2 & ZF), Pentax and Universal (screw) mounts.